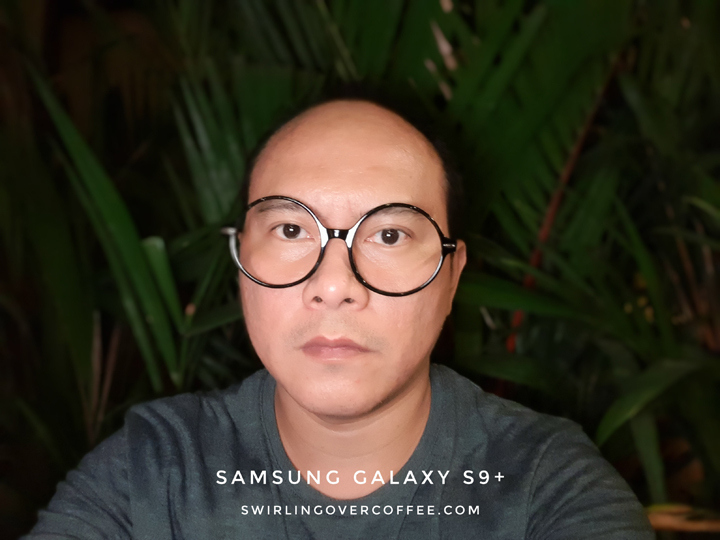 The P52,990 Galaxy S9+ (64GB) is, as of this post, Samsung’s best smartphone (it edges out the single-rear camera S9 with more RAM, storage, and dual rear cameras). 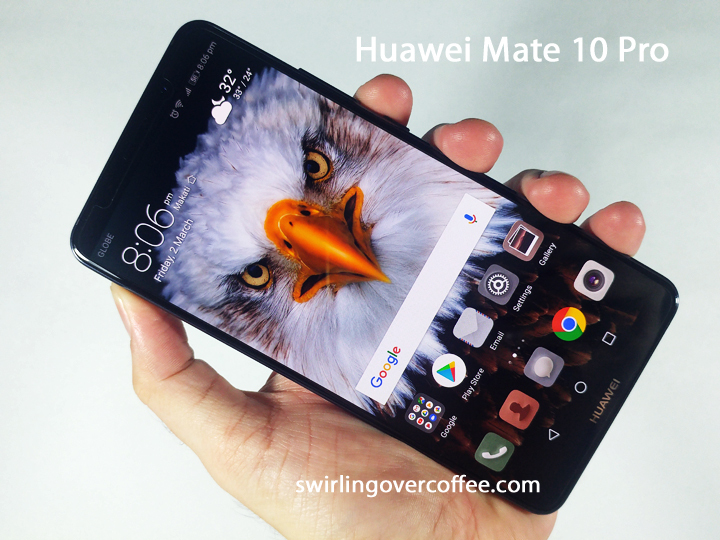 But the already available P36,990 Huawei Mate 10 Pro can probably go toe-to-toe with the S9+ in both specs and, as in the title, camera performance. 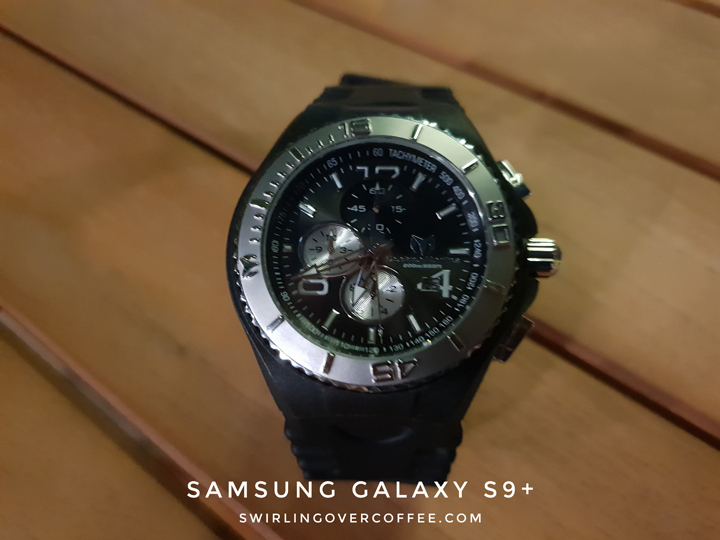 We got some hands on time with the S9+ during its launch, where we held a quick shootout between two OLED/AMOLED, waterproof, 6GB RAM, dual-rear camera smartphones. Only stills and not video are included, and Pro Mode on both phones were not explored, in this shoot out. See the full specs of both phones below. Selfies in 4:3 aspect ratio, both with onscreen flash, bokeh, and beauty mode on. A few things we noticed. First, the Mate 10 Pro’s 8MP front camera seems to have a wider field of view than the S9+’s own 8MP front camera, so you can fit more into the frame, without extending your arm too far. Second, S9+ takes about a second and half longer to capture a selfie when on screen flash is on. The screen flash takes up much of that time maintaining the display’s light on your face during capture. Since some of us re-shoot our low light selfies, retaking shots on the S9+ can take a bit longer given the “slow” capture, and that you have to hold your pose as long as the on screen flash is happening. Maybe it’s a small inconvenience, for a P52,990 flagship, that many people can forgive. Meanwhile, on the Mate 10 Pro, capture is fast, as is the on screen flash. 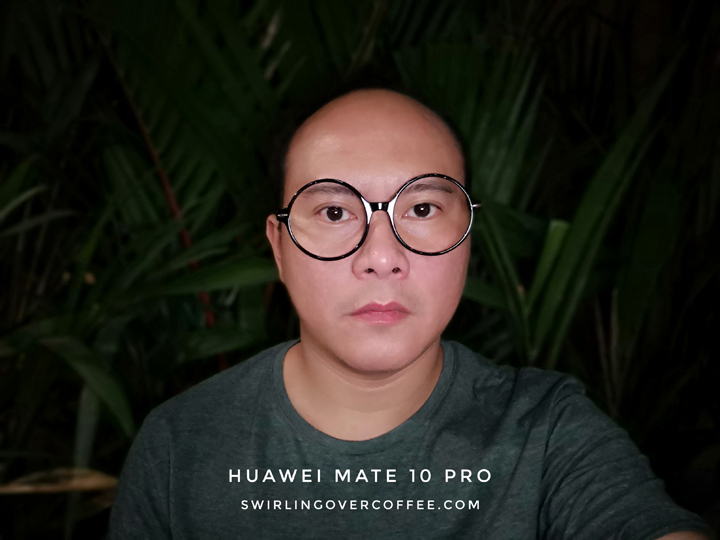 Third, both phones have a different approach to beautification when on screen flash is activated – the Mate 10 Pro tends to make your skin look rosy and your lips pop out, which is great for low light parties and drunk-together-groufies; the S9+ seems to make you a bit pale, but evenly lit. Some would call this a more natural look. If we never saw the selfie of the Mate 10 Pro and only had the S9+’s, we’d probably think the S9+’s was better. The Mate 10 Pro seems to be the winner with low light selfies. Groufie in 4:3 aspect ratio with bokeh and beauty mode on. The sun was going down when we took these groufies and I had to extend the S9+ further away from me when taking this pic. Right away we could tell that the colors of both our shirts and the leaves behind us, and our skin tones were more accurate on the Mate 10 Pro. 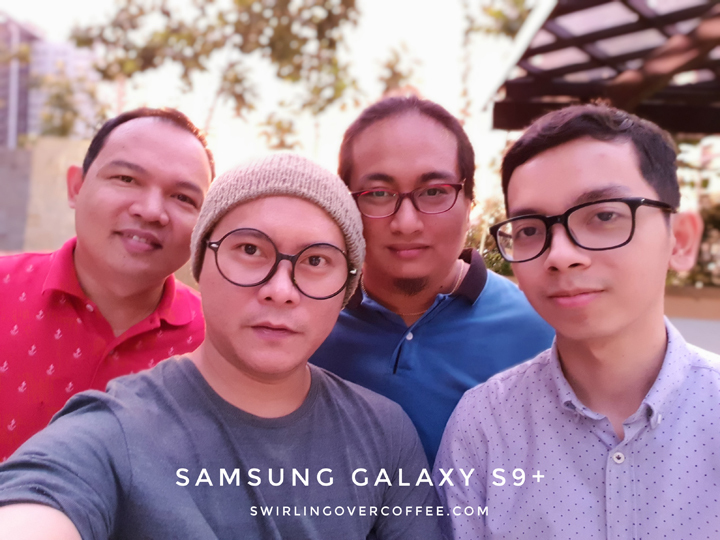 The S9+’s groufie was softer, Neil’s hair (the kid with glasses) and the design on Raffy’s shirt (the guy in red) had less details, and our faces were almost uniformly darkened and smoothed out. On the Mate 10 Pro, our individual skin tones were retained. Maybe we’re nitpicking here. We’re sure some of you will be perfectly happy with the groufies the S9+ can deliver, and that’s fine. But choices are good. Just a pause to thank the people who posed with me. 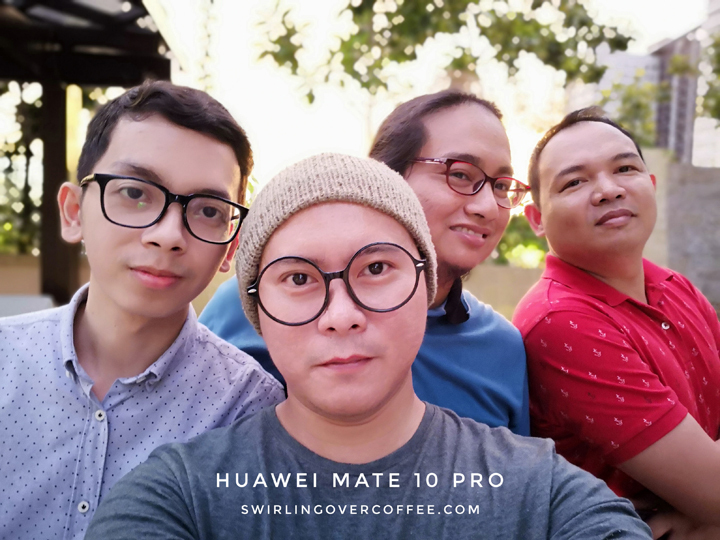 In the Mate 10 Pro groufie, L-R: Neil Goco Jr. of Pinoytechblog.com, Irwin Allen Rivera of SwirlingOverCoffee (that’s me), Anjie de los Reyes of Teknogadyet.com, and my neighbor, Raffy Pedrajita of Techpatrl.com. Bokeh close up shot. 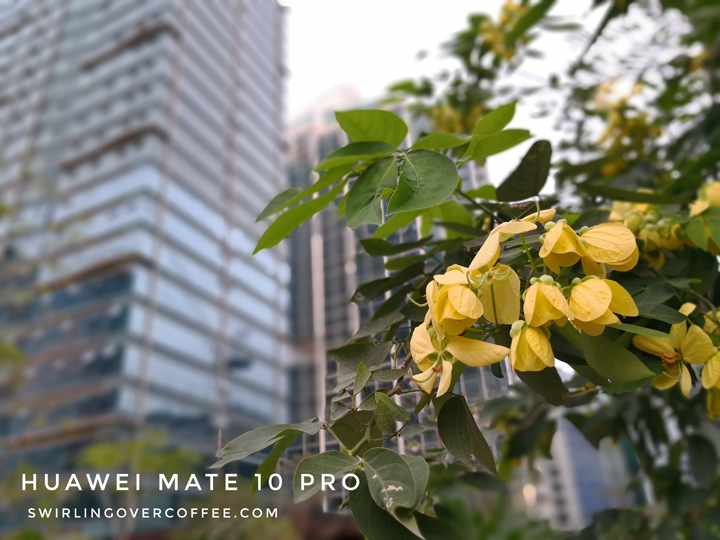 4:3 aspect ratio, auto mode, bokeh activated on the Mate 10 Pro, Live Focus (bokeh) activated on the S9+. The Mate 10 Pro’s rear cameras have a wider field of view (more of the scene can fit it the frame) compared to the S9+s rear cameras. 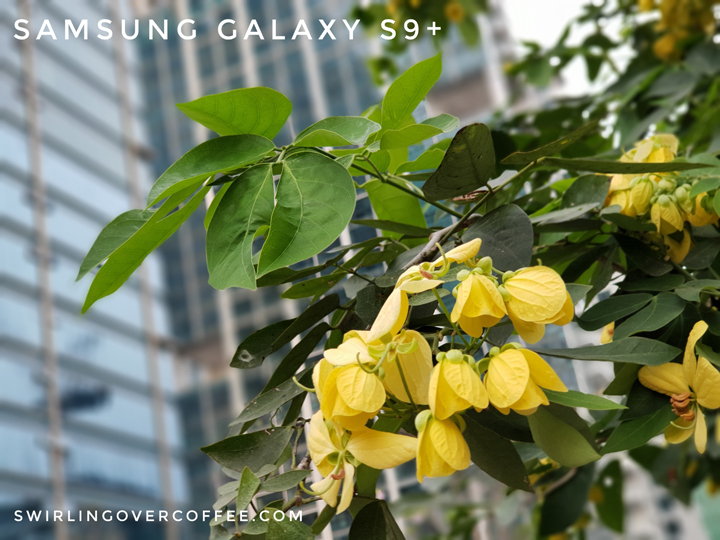 While it seems the same amount of detail was captured by both phones, the S9+’s image was oversaturated: those leaves were not that green and those petals not that yellow. This boils down to user preferences as some of us seek that level of saturation (and even adjust them on image editing apps). However, some of us can “tell” when images are unnaturally colorful and want the more natural results. That said, a quick tap on the Mate 10 Pro’s camera app can amp up the saturation if that’s what you want. Bokeh close up shot. 4:3 aspect ratio, auto mode, bokeh activated on the Mate 10 Pro, Live Focus (bokeh) activated on the S9+. In taking both photos, we tapped to focus on the center of the wristwatch. HDR mode not activated on Mate 10 Pro. S9+ has auto-HDR. If you notice both images are a bit soft, that’s because both phones really tried to squeeze out as much light as possible and post-process to satisfaction. 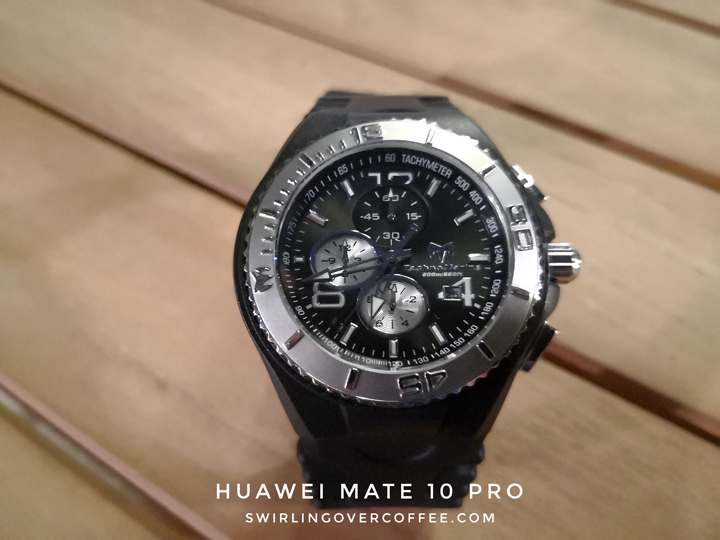 Not only is the Mate 10 pro’s image brighter, it also captured more detail on the watch’s markings (markings that were blurred on the S9+). 18:9 aspect ratio, auto-mode, on both phones. HDR not activated on Mate 10 Pro. S9+ has auto-HDR. In taking both images, we did not tap to choose a focus point. Here’s where the S9+ edges out the Mate 10 Pro a bit. The S9+’s auto-HDR kicked in to pull out details and brighten the entire scene. We’re wondering why the S9+ could not do this in the wristwatch macro. While the S9+ shot is slightly noisier and grainier than the Mate 10 Pro’s, this is how you want your evening group photos to come out. 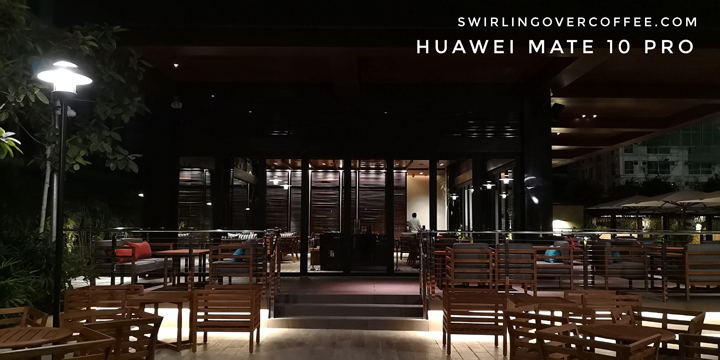 Now, when the Mate 10 Pro’s HDR is activated, it catches up with the S9+ with more details pulled from the shadows. 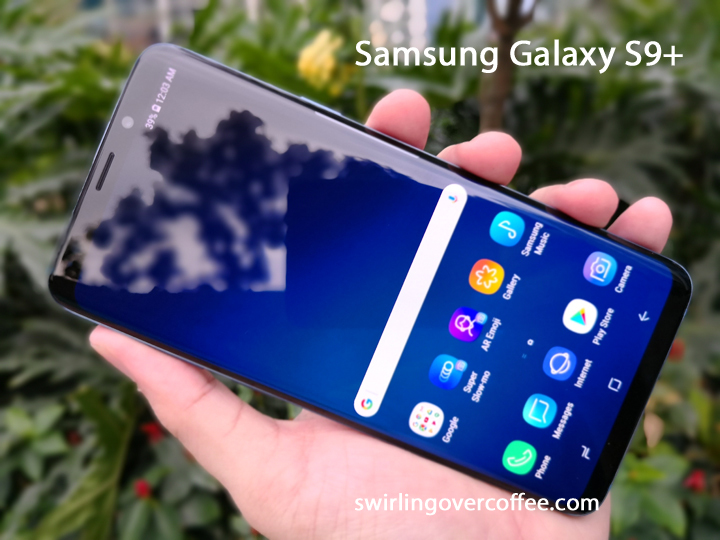 And that’s as much as we could squeeze out of the limited time we had with the Samsung Galaxy S9+, during its launch. Food for thought: If any flagship phone can match (not exceed) the S9+ in camera performance, then suddenly the S9+’s P52,990 price may be hard to justify (at least to those looking for a good flagship camera phone). Now, if a flagship phone can best the S9+ in camera performance and offer a lower price, that would be awesome. The Huawei Mate 10 Pro is now only P36,990. This post was not sponsored by Huawei. Also, I bought my own Huawei Mate 10 Pro, thank you very much. Below are the specs of both phones.